The distribution of large galaxies wthin 20 million light years of us is very irregular. This would seem to be the only plausible configuration that is in agreement with what is stated about the 7 superuniverses. The Milky Way is superuniverse #7 which is said to have roughly completed the swing around the southern bend of the circuit. Superuniverse #1 doesn't seem to be visible to us, very likely because it is hidden beneath the dense Milky Way star field. Superuniverse #2 is evidently the majestic NGC 5128 at a distance of possibly 15.2 million light years. Superuniverse #3 may be the likewise majestic NGC 4945 roughly the same distance away. Superuniverse #4 in this configuration would be the serene and lonely ESO 274-01 at a distance of 16 million light years. Superuniverse #5 would seem to be ESO 97-G13 at 12.2 million light years. It is also called Circinus after the constellation it lies in. Superuniverse #6 might be IC 4662 at a distance of 6.5 million years. If this is correct then Havona would lie roughly 8 million light years away in between the constellations Lupus and Centaurus. This is an area hidden by the Milky Way star field. This chart shows where they lie in our sky as viewed from Bogota, Columbia which lies at an optimal latitude for viewing. Those galaxies you mention feature in Marshall McCall's 2014 "Council of Giants". For reference, the pic below shows one way to put the "grand universe wheel" neatly within the "Local Sheet". Notice how McCall's "persistent elliptical ring" seems to serve as inner fringe of the first outer space level? Hi Nigel, Thanks for that information. It sounds very interesting though I've only read the abstract. I'll study the paper tonight. For those who are not familiar with the names. The Centaurus A galaxy is also called NGC 5128. One rather unique and impressive looking galaxy for sure. It might be that distance and other information about the galaxies has changed a bit in the last 5 years. Also, one Russian astronomer claims very different figures for redshift and distance for some of the galaxies. A question: How do guys "handle" redshift in your professional discussions? Do others consider the possibility of the universe "breathing" as the papers explain? Nigel, you have gone very public in your support of the UB's cosmology, how do your fellows react? Thanks to all for your even handed treatment of the available scientific facts and how they relate to the revelatory information we have in TUB! Very interesting! Last edited by pethuel on Wed Apr 10, 2019 7:38 am +0000, edited 1 time in total. "It might be that distance and other information about the galaxies has changed a bit in the last 5 years." 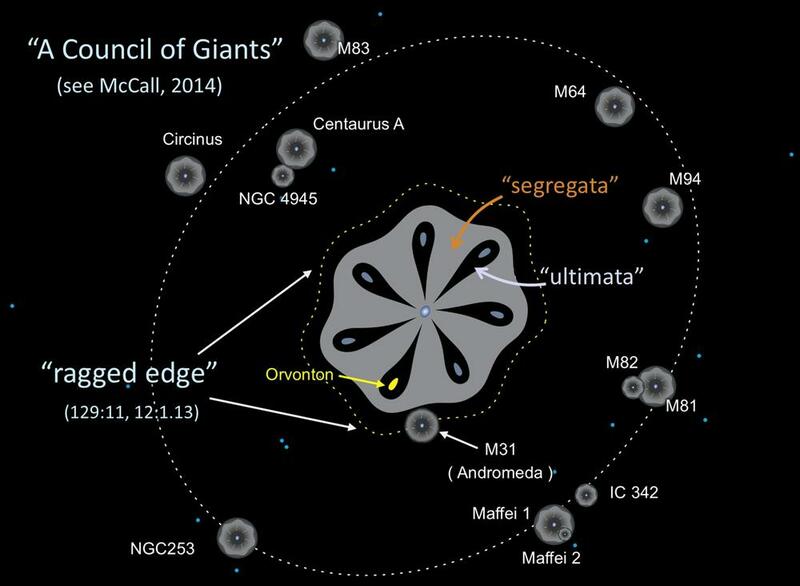 One of the main results reported in McCall's paper were new estimates of distance to some of the galaxies he included in his Council of Giants. Especially interesting was getting a distance of 11 million light years for IC 342, which is highly obscured in the zone of (optical) avoidance. Previous estimates ranged between 8 to 30 million light years. Original hour-long version on YouTube reports "removed due to copyright claims". That's a high quality video. McCall has done some great work. There is an 11 minute video from someone else on YouTube that provides some interesting details and discussion on Circinus (to be found by searching "Council of Giants").